This set of Compilers test focuses on “Obtaining the Regular Expression from the Finite Automata – 2”. 1. Which of the following identity is true? Explanation: The former Re can be produced from the latter one. Explanation: Out of all RE mentioned only the first string certainly has bbbb as substring. Rest all just have a possibility of having it. Explanation: ab*+ba* is the expression in which which a single a is followed by any number of b’s a single b followed by any number of a’s. Explanation: Regular expression is represented by regular language. Explanation: Only this expression ends with bb only. Explanation: It is an important law primarily used in conversion. 7. If L1 and L2 are regular languages is/are also regular language(s). Explanation: All these expression give us a regular grammar when L1 and L2 are regular. Explanation: Because it would give either a or b. 9. Which of the following regular expression denotes zero or more instances of an a or b? Explanation: This expression gives o or more instances of a or b. Explanation: Either b or a can lead followed by c this expression can be achieved by C as well. 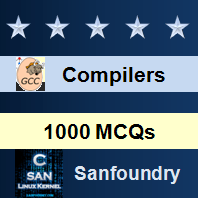 To practice all areas of Compilers for tests, here is complete set of 1000+ Multiple Choice Questions and Answers.